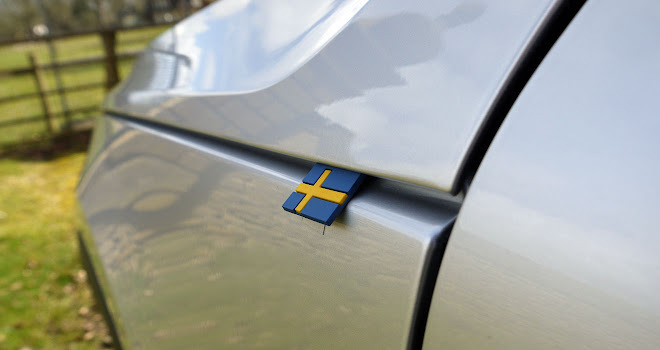 Volvo has produced some knockout designs over the past few years, with handsome cars like the V90 estate and XC60 off-roader boasting great proportions, neat details and an effortless sense of poise. 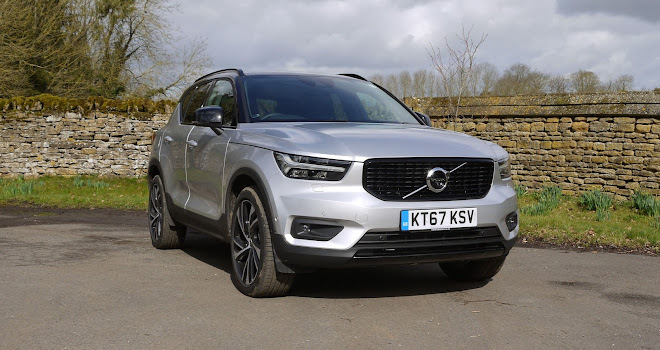 The new XC40 manages to preserve all those great qualities while looking almost entirely unlike the rest of the range, which is a feat most rivals have singularly failed to pull off. 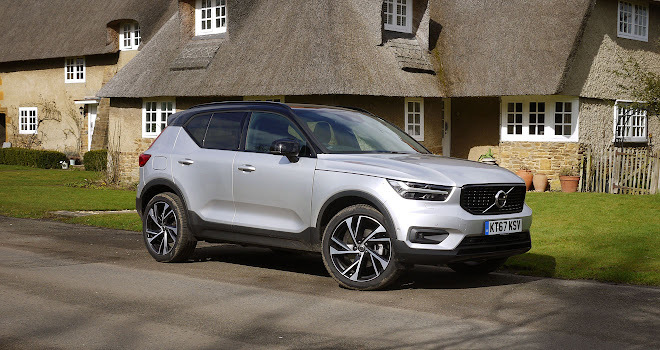 It may seem hard to believe but the XC40’s boxy, chiselled look caused a degree of nervousness among Volvo top brass when the design was first dreamt up. That’s why we got to see such an accurate preview of the car almost two years ago, in the shape of the 40.1 concept. The generally rapturous reception the concept garnered must have produced a phew or two at the company’s Gothenburg headquarters, while any onlookers not convinced by the concept’s shape at least gained a couple of years to get used to the idea of a chunky, cheeky Volvo before the XC40 arrived in showrooms. 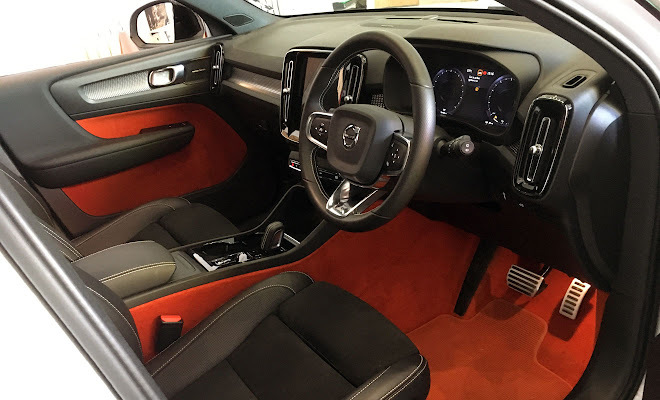 The production car’s interior design is as bold as the exterior, exuding a confidence most easily demonstrated when bright “Lava Orange” carpet is chosen, an option inspired by the rich red interior of Volvo’s classic P1800 coupé. The same felt carpet runs up into the doors where it not only sears the eye but also lines the door pockets. 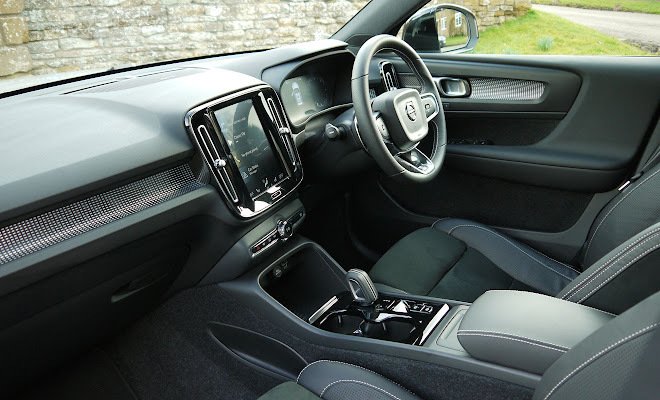 Those pockets are notably larger than average as a result of Volvo cleverly moving speaker units out of the doors and into the underside of the dashboard, freeing up space for your odds and ends. Clever storage is a theme that runs right through the XC40, with a deep cubby under the centre armrest sized for storing a box of tissues, a pair of deep cupholders in the centre console and even a removable flip-top bin for stashing sweet wrappers and other bits of detritus (interior designer Eric Gunnarsson Hörnsten seemed visibly enraged by the notion of a cluttered up, litter-filled XC40). There’s also a wireless charging receptacle at the front of the centre console, along with sockets for hooking up your phone for Apple CarPlay or Android Auto (although compatibility costs £300). The glovebox lid features a clever flip-out hook, presumably for hanging takeaways, while in the boot there’s a lift-up floor that can be folded up and slotted firmly into a boot-divider mode, complete with a row of three hooks for shopping bags. Finally the parcel shelf can be lifted out, flipped over, and stowed under the boot floor when you need to transport bulky items or, say, a dog. While fiddling around in the boot I was pleased to spot an actual spare wheel, rather than a can of tyre-sealing gunk. The XC40 is not as small as it looks in pictures, and the cabin generally feels airy and roomy. 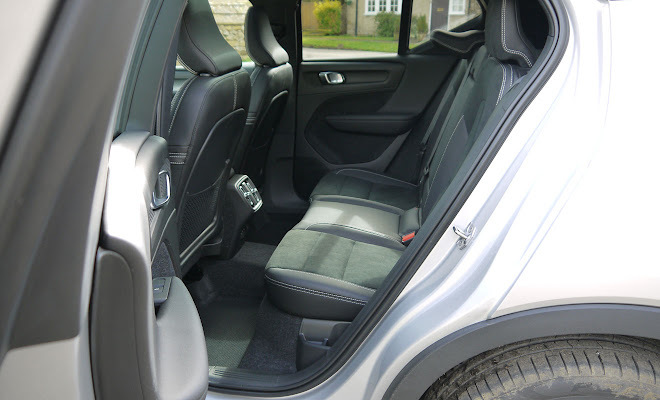 The rear seats provide adequate space for adult heads and knees, though getting in and out through the relatively narrow rear doors can feel a squeeze unless you possess limber legs and a fondness for yoga. 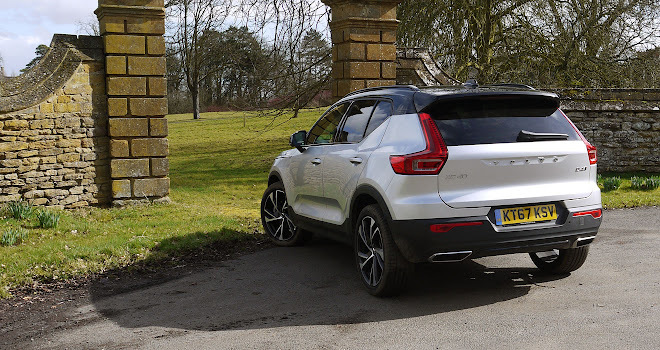 On the move the XC40 didn’t disappoint, with handling that felt as neat and tidy as the car’s centre console. I tried the sporty R-Design version in diesel D4 trim with big 19-inch wheels, and it proved quiet, comfortable and serene even over some nasty roads with sharp potholes. The car felt brisk too, as it should with 190 horsepower and 400Nm of torque on call. The 2.0-litre D4 edition is apparently capable of hitting 62mph in 7.9 seconds. The model I tried also came with all-wheel drive and an eight-speed automatic gearbox. I found that the box shifted quickly and intelligently, with the option of wheel paddles for control freaks. 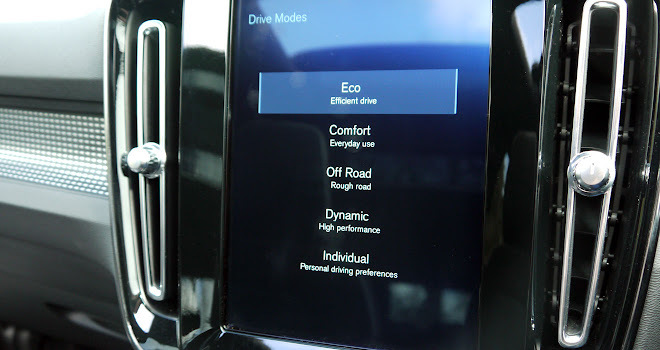 A small button on the lower dashboard offers a choice of modes, including an Eco setting for trimming the car’s thirst. Selecting Eco switches the 12.3-inch digital instrument cluster into an efficiency monitoring mode, replacing the rev counter with a demand gauge, for example. The gearbox will also adopt a coasting mode whenever your foot lifts off the throttle in Eco mode, helping to preserve momentum and reduce fuel consumption on downhill stretches. The engine also features an unobtrusive start-stop function to keep the engine asleep when stationary. I drove the XC40 for a couple of hours without a break and found it extremely comfortable and relaxing to drive. 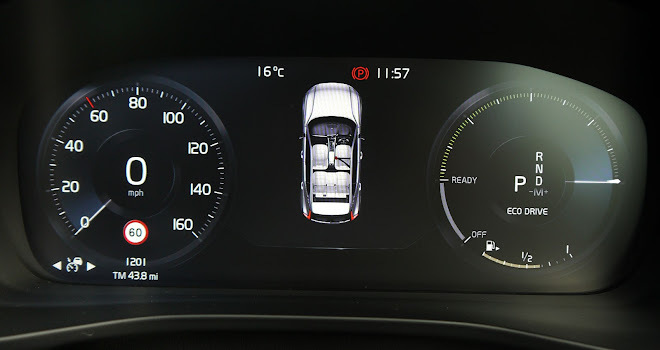 I also made use of Volvo’s helpful Pilot Assist system, part of an Intellisafe Pro option pack. It’s an adaptive cruise control that governs speed and also steers the car, keeping it in the centre of lane markings. This assistance works extremely well on busy motorways and dual carriageways and, even though you have to stay alert and keep your hands on the wheel, I’ve found it a boon during long drives. Other software in the car is less persuasive. On startup, the XC40’s nine-inch portrait touchscreen requires about half a minute to fully load up all its functions, the last to arrive being navigation. If you want to jump in and feed in a destination, bring a book. 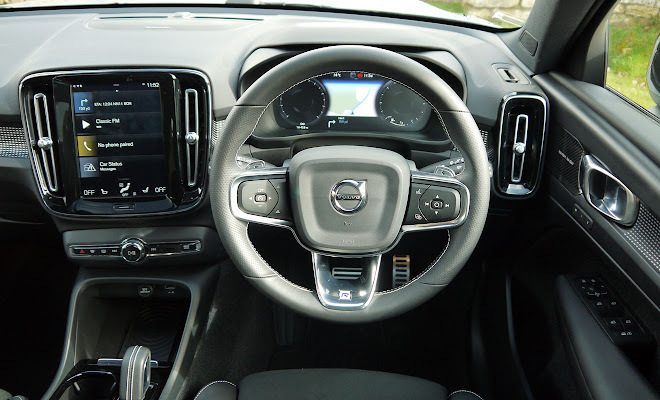 It’s also a pain to have to use the touchscreen to adjust ventilation – cranking up the temperature requires eyes off the road for longer than would be needed with a couple of simple knobs. That seems like an odd decision for a car otherwise stuffed with sensible Swedish safety systems, including automatic emergency braking as standard across the range. Fuel consumption might also disappoint. The D4 I tried is rated at 55.4mpg and 135g/km under the old NEDC regime, or as bad as 39.8mpg under the newer WLTP testing process. The latter figure is pretty close to what I saw having driven for an hour in Eco mode. More frugal models, including a plug-in hybrid in 2019 and a fully electric version at some point thereafter, are also in the pipeline. 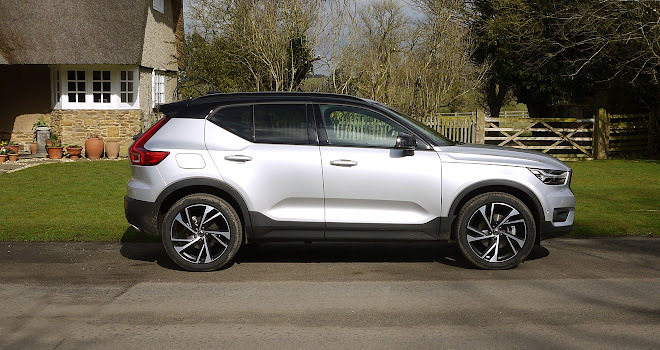 On balance, the XC40 offers a huge number of positives but a few areas of disappointment. If you like the looks, it shouldn’t prove too difficult to dismiss any misgivings.